Studio Setup 7 Studio Setup 7 is for all you aspiring YouTube superstars. Now you don't have to settle for the the microphone on your video camera. Have you ever seen a YouTube video from a musician who clearly has a lot of talent, but the sound quality prevents them from showing it? It's disappointing to see people work so hard to learn/write their songs, rehearse it down cold, only to do a quick and dirty recording that doesn't do them justice... especially when it can be so easy. With a few simple pieces of equipment you can upload your performance the way you intend it to be heard for all to enjoy. This is a quick and easy way to make your recordings sound great. This does not include the video components required but that's the easy part - all you need is a video recorder. Most recording software will have a way to import the video file so you can sync the audio and video together seamlessly. 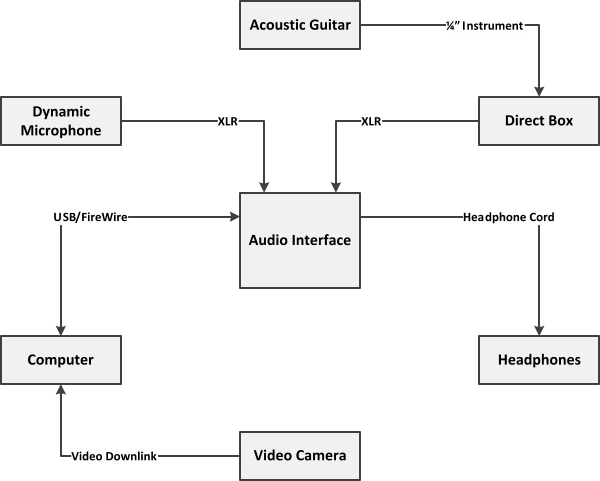 No one has to know you're using a dedicated YouTube recording setup to make your songs sound great.